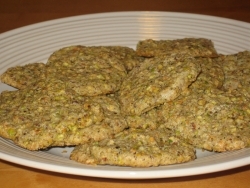 Syrian cookie recipe perfect for Passover since the ingredients do not include flour. Grind pistachios finely in a food processor and set aside. In a large bowl, beat the egg whites until stiff peaks form (mixer setting on high). Carefully pour sugar over stiff egg whites and fold in with a wooden spoon. Add the pistachios and fold in. Place tablespoons of dough on a greased cookie sheet, arranged about one inch apart. Bake at 300 degrees (F)until lightly golden around the edges, about 15 minutes. Allow cookies to cool before removing from cookie sheet. Doesn't sound like anyone is sneepilg well.I suggest letting the dogs sleep in different areas of the house.I also suggest getting another bed just like the poodles, so the JRT can sleep on one, and not bother the poodle in the other. He obviously seems to like the larger bed.If you're adamant about not crating at night, you're asking for trouble letting both dogs be territorial over their sneepilg arrangements. The only way to fix it is to have more beds than can be fought over, or have them sleep in areas where they can't compete with eachother ie, separate rooms/crates.References : Was this answer helpful? Tried it. Loved it. Great taste. Like eating pistachios but without the shells and mess. Highly recommended! Character count (1000 max): 256 1000 characters max.